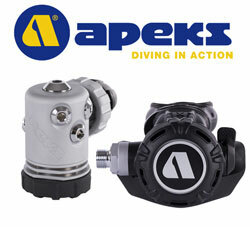 The Apeks XL4 Regulator is a lightweight coldwater rated high performance regulator. Break through, innovative over-moulded first-stage end cap and environmental diaphragm helps prevent ice build-up that can cause first stage free flow in extreme circumstances. Also protects the first stage from impact damage. Unique over-balanced diaphragm design - as the diver descends, the over-balancing feature allows the medium pressure gas in the hose to increase at a faster rate than ambient. This results in superior performance at depth. Standard metallic hose connection for interchange ability.